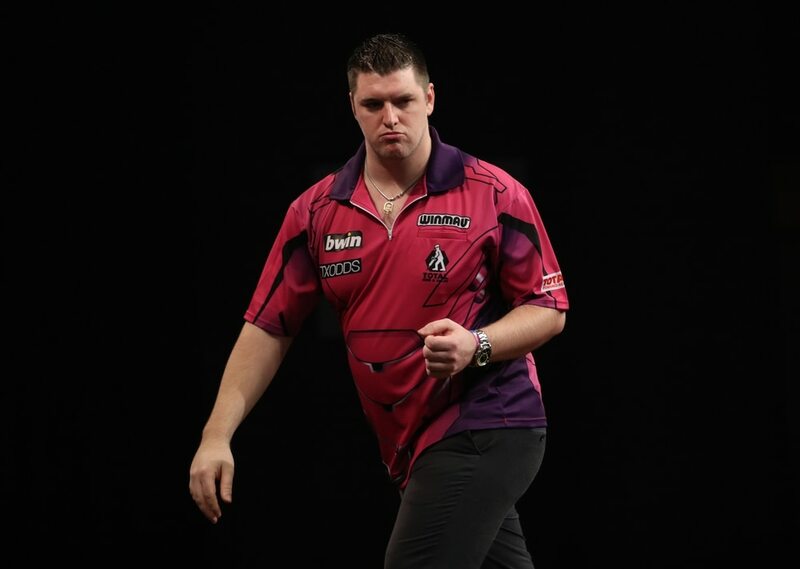 Daryl Gurney secured his place in the bwin Grand Slam of Darts second round with a 5-1 win over Darren Webster, completing the group stage with three impressive wins. Gurney opened the game with a 100 finish and defied two 180s from Webster to claim the second, with the Norwich ace hitting back in leg three but unable to stop the World Grand Prix champion's charge to victory. "I wanted to get the win and to top my group and I'm delighted to have done that," said Gurney, who averaged 99 and hit five doubles from eight attempts. "I'm loving it and it's great to win my group in my first time here. "My sole focus was getting the win and I had no idea of what had to happen in relation to Darren and Mark, Darren had some darts at a double that he didn't take and I hit some crucial finishes there. "I'm very pleased with how I've been playing because I was nervous with the short format, but now I want to relax and play my best game." Webster now faces a nine-dart shoot-out at the end of Tuesday's play against namesake Mark Webster, who lost out 5-2 to Danny Noppert as the Dutchman claimed a consolation victory in Group D.
Reigning champion Michael van Gerwen completed Group A with a third successive win, and was in dominant mood as he averaged 108.29 as he defeated Joe Murnan 4-2. Murnan landed a 119 finish as he shared the opening four legs in his search for a consolation victory, but Van Gerwen took out 135 for a 12-darter before punishing two missed doubles from his opponent in leg six as he raced away to victory. "There was not a lot of a pressure on me because I was through before the game, but I still wanted to win to keep my confidence up and I'm happy with this performance," said Van Gerwen. "I played well and had a couple of nice finishes. I can still improve but I performed really well today." Rob Cross secured qualification alongside Van Gerwen from Group A as he claimed a 5-2 win over Ross Montgomery in their decisive clash. Montgomery took the game's opening leg and was level following four legs, but Cross took command with an 11-darter, took out 88 for a two-leg cushion and sealed his second round spot in style with a 164 checkout. "I knew I had to win tonight to get through and it's lovely to get over the line," said Cross. "Ross is a great player and he's been a bit unlucky because he played well against Michael and me, but it's all about winning. "My finishing was good in stages, I’m glad just to get over the line and get the win. "It's been fantastic so far this week. The crowd all love the darts and it's been a massive experience for me, I'm looking forward to going into the knockout stages."